China has fitted the final piece on what will be the world's largest radio telescope, due to begin operations in September 2016. The 500 meter wide Aperture Spherical Telescope, or FAST, is the size of the 30 football fields. 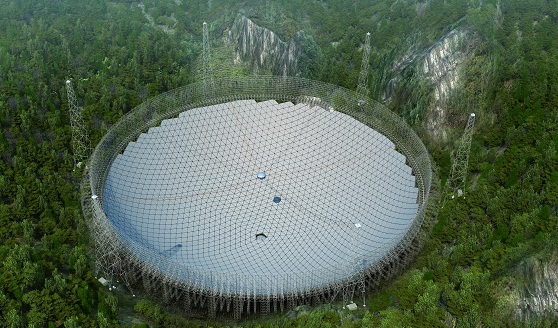 FAST is a radio telescope under construction located in a natural basin in Pingtang County, Guizhou Province, southwest China. Construction on the FAST project began in 2011 and is scheduled for completion by September 2016. It will be the world's second largest radio telescope (after the Russian RATAN-600, which has a sparsely filled aperture). It costs 700 million yuan (around 110 million US dollars at the time). The telescope was first proposed in 1994. The project was approved by the National Development and Reform Commission (NDRC) in July 2007. On December 26, 2008, a foundation laying ceremony was held on the construction site. Construction started in March 2011, and the last panel was installed on the morning of 3 July 2016. The chief scientist of the project is Nan Rendong a researcher with the Chinese National Astronomical Observatory, part of the Chinese Academy of Sciences. FAST will have 4600 triangular panels and be similar in design to the Arecibo Observatory, utilizing a natural hollow (karst) to provide support for the telescope dish. As the name suggests, it will have a diameter of 500 metres (1,600 ft). FAST will be capable of covering the sky within 40° from the zenith (compared to Arecibo's 20° range). Its working frequency range will be 70 MHz to 3.0 GHz,with a pointing precision of 4 arcseconds.The 19-beam receiver is built by the CSIRO as part of the ACAMAR collaboration between the Australian Academy of Science and the Chinese Academy of Sciences. The site's karst depression is large enough to host the 500-meter telescope and deep enough to allow a zenith angle of 40°. The light-weight feed cabin —suspended 140 m above the reflector— will be driven by cables and servomechanisms in addition to a parallel robot as a secondary adjustable system to move with high precision.